Cadet MSgt Stephani Bradley was awarded the JROTC Academic Award, Sr. Category during Lakeview High School’s Air Force JROTC quarterly awards ceremony Oct. 31. Lakeview High School’s Air Force JROTC cadet corps hosted parents and family members as guests to take part in the first quarter Cadet Promotion and Recognition Ceremony Oct. 31. The program recognized the achievements of the corps 75 cadets that comprise 25 percent of the school population. Overall, 49 cadet promotions, 95 unit level ribbons and 19 rocketry badges were presented for achievements in leadership courses, academics, fitness, community service, and overall performance for the first quarter. Trophy winners for August-October include, from left, Cadet SrA Amber Hembree, Overall Academic Award, Sr. Category; Cadet TSgt Tierra Stacks, Outstanding PT, Female Sr. Category; Cadet TSgt Destinee Britt, Outstanding PT, Female Jr. Category; Cadet TSgt James Earp, Outstanding PT, Male Sr. Category; Cadet Amn Allison Anderson, JROTC Academic Award, Jr. Category; Cadet Amn Micah Martin, Outstanding PT, Male Jr. Category; and Cadet Amn Meagan Corley, Overall Academic Award, Jr. Category. 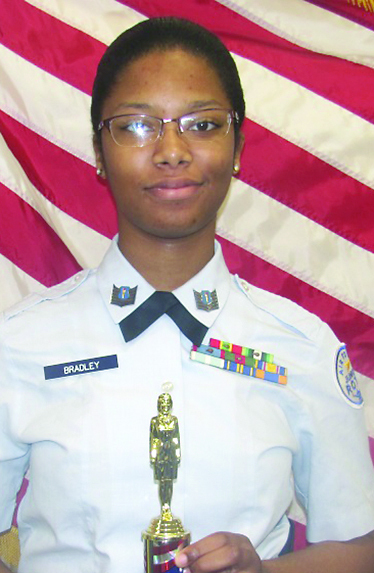 Cadet Amn Zoie Britt was selected Lakeview High School’s Air Force JROTC Cadet of the Quarter, Junior Category. Britt posted a 99 percent average in all her courses, a 98 percent average in Air Force JROTC, performed four hours of community/school service, is a color guard team member, and ran 1-mile in 7:47. Cadets promoted to Cadet Technical Sergeant during Lakeview High School’s Air Force Junior ROTC Quarterly Promotion and Recognition Ceremony were, from left, Destinee Britt, Tierra Stacks, Blake Smith, James Earp, Olivia Litton, Ethan Smith, Zack Gorham and Kain Custis. Cadets promoted to Cadet Staff Sergeant during Lakeview High School’s Air Force Junior ROTC Quarterly Promotion and Recognition Ceremony were, from left, Olivia Litton, James Earp, AJ Holden, Blake Smith, Tierra Stacks, Ethan Smith, Zack Gorham and Kain Custis. Cadets promoted to Cadet Senior Airman during Lakeview High School’s Air Force Junior ROTC Quarterly Promotion and Recognition Ceremony were, from left, Amber Hembree, Emma McDonald, Devin Ballard and Errik Stacener. Cadets promoted to Cadet Master Sergeant were, from left, Shalynn Matthews, Zy’Keious Manual, Ashley Blake, Joshua Long, Karmen Jarriett and Blake Smith.